This hefty price tag takes us back a few years to when all 42in plasma TVs - invented by Fujitsu, incidentally - cost this much. 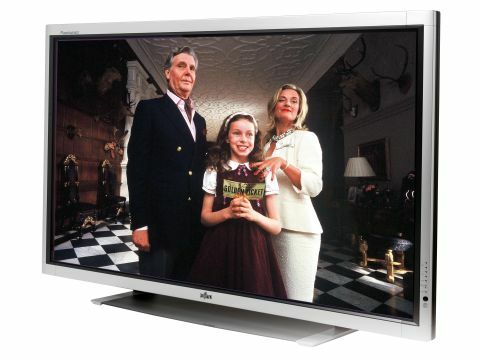 This 63in example, the second largest on the planet, isn't a TV as it lacks a digital or an analogue tuner. But at this size Fujitsu is going for the custom install market, whose customers who don't really care about such trivialities. Even speakers are an extra £700 for the pair and there aren't any Scarts on the TV's rear - so buy with care. But despite it being no more talented than a business-type plasma display on paper, the P63XHA40 is at least styled for home use and does look attractive. That goes double for the on-screen images from HDTV and progressive scan DVD feeds, which glisten with detail and colour. Limited, but brilliant.